Water is one of the most abundant resources on our planet. In total, about 71% of the Earth’s surface is covered by water. Unfortunately, more than 96% of that water is found in the oceans. When it comes to fresh water resources that we can drink, just 30% of it is found in ground water. For fresh water rivers, lakes, and swamps, just 0.3% of our supply is found. That is why desalination has always been a highly desirable option. Desalination allows us to create fresh water that can be consumed from the saltwater resources that are so abundant in our world. Desalination can occur on a personal level, with a small membrane and pump, or it can occur on an institutional level. One of the largest desalination facilities in the world is located in Florida and it can produce up to 25 million gallons of fresh water, from saltwater, every day. Here are the top pros and cons of desalination to consider. 1. It is a proven technology that works on multiple levels. Desalination is a process that anyone can use to create fresh water for consumption. Right now, you can purchase a desalinator for seawater, produced by Katadyn, for about $500. Their Survivor 35 model weighs just 2.5 pounds and produces about two pints of viable water per hour. It is hand-operated as well, which means it can be used with a life raft, an emergency kit, and meet other needs for coastal populations. More than 120 countries operate desalination plants right now, with more than 13,000 facilities currently in operation. 2. It stops the threat of drought. Water shortages are becoming more common as weather patterns around the world are changing. Some communities, such as Cape Town, South Africa, have even set dates where they expect to run out of water completely. The installation of desalination plants would make it possible to reduce the impact of drought because we could ship fresh water supplies to areas of the world where it is needed the most. This water could be used for drinking, irrigation, and other general-purpose needs. 3. It could limit the effects of famine. Water is what provides life. It is required to grow crops. When drought or other water shortages occur, famine is sure to follow. Instead of shipping in food supplies to alleviate hunger and reduce the effects of famine, we could invest into desalination plants and water transportation structures that would allow communities to continue growing their own food. That would allow workers to maintain their employment at the same time, providing an economic benefit to each community simultaneously. 4. It may be able to reduce global energy costs. The movement of water has a specific energy cost which must be considered. The developed world has a specific infrastructure network which transports water to various communities from its source. Building this infrastructure has a capital expenditure associated with it. Moving the water requires energy that has a specific cost structure with it. By creating more water resources through desalination, we could reduce global energy costs and shift our production efforts toward other industries. 5. It could stop water diversions from happening. In the United States, 20% of the most endangered rivers face threats of extinction because of excessive water withdrawals which occur. Another 20% are endangered because of water diversions that occur. In California, more than 100 miles of mainstream river have been dry for 50 years or more because of the practice of diversions. Not only does this affect natural habitats, it also changes our access to marine life. Desalination would reduce the number of diversions necessary, which would restore water access to areas that may not have had it for decades. 6. It would allow us to build up water reserves for future use. The Earth goes through natural weather cycles. Some years may bring lots of rain and snow. Other years may bring little, if any, precipitation that can be used as drinking water. Through desalination, we have an opportunity to create fresh water reserves that could be used when access to new water supplies becomes limited. We already have the infrastructure in place to hold this water as well, thanks to our hydropower facilities, underperforming lakes and rivers, and other areas of water retention. 7. It could allow us to stabilize local, regional, national, and global economies. Water is what breathes life into every aspect of our daily routine. Without it, we are unable to function as we want. By creating additional water supplies that can be accessed by the general public, we would be able to stabilize economies. We would create predictable cost structures for local utility customers. We would be able to produce more products, manufacture more goods, and maintain agricultural production levels. A diversified water supply is directly linked to stable, local economies. 8. It could create higher levels of water independence. Many communities rely on water transportation technologies to provide fresh drinking water for residents. Through desalination, coastal communities could create their own independent water source. This would eliminate the purchasing and transportation costs that are being paid to pipe water in from another location. 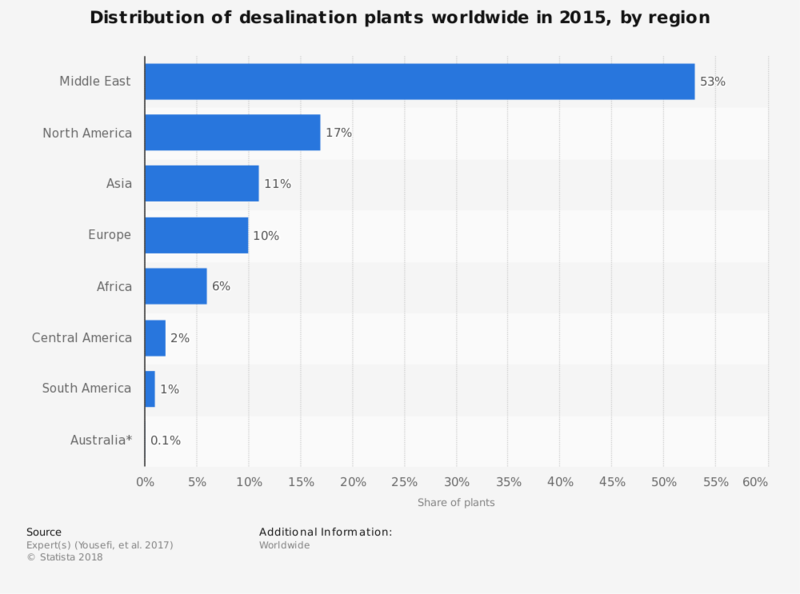 If given enough time, the savings generated by desalination in this type of circumstance could eventually offset the capital expenditures required to install desalination technologies. 9. It can create usable products for a variety of industries. Although the salts that are taken from water during the desalination process can be highly concentrated, they can also be used by a variety of industries in unique ways. Salt is often used as a de-icing agent for roadways, which means brine could be a suitable replacement. A liquid brine solution has been found to be effective at keeping ice off of transportation networks. Brine can also be used to control dust levels, be used as an injection material for deep well drilling, and even be mixed with cement to create a product called saltcrete or saltstone. 10. It can operate on virtually any power supply. Desalinators can be powered by diesel fuel, electrical power, or even solar power. It all depends upon what the needs of a household or community happen to be. For individual desalinators, electrically powered models tend to be the most economical solution. Diesel-powered facilities are required if large quantities of fresh water must be produced. Some coastal communities are very rural and power access may be limited, which would mean a solar-powered unit would be the best option. 11. It is a technology that can be installed almost anywhere. Desalination facilities can be placed almost anywhere there is a saltwater resource. That means they can often be placed away from residential areas, limiting the exposure risks families would have with this water creation option. In return, the seawater provides a resource that is almost inexhaustible when it comes to the creation of fresh water supplies. That means every community with access to desalination is able to benefit from a reduced level of pressure placed on their fresh water resources. 12. It can help to preserve certain habitats. Although the wastes from a desalination plant can negatively impact natural habitats, the reduced pressure on fresh water environments can help to preserve them as well. That means rivers, lakes, and marshes can be preserved in their natural state, creating wildlife refuges. These refuges can even be turned into environmentally friendly tourism opportunities that have a positive economic impact at the local level. 1. It is a costly technology. For a viable desalinator that can be used at home, households would need to invest more than $5,000 to have enough water on a daily basis for a family of four. When discussing the costs on an industrial level, a 100 million gallon per day facility in Texas has been proposed at a cost of over $650 million in recent years. Even a facility like the one in Florida, which produces 25 million gallons per day, would have an installation cost of over $30 million right now. 2. It creates high levels of waste products. For the desalination process to be effective, the salt must be completely removed from the water. That means salt becomes a waste product with desalinated water. The salts which are removed are often concentrated. In this state, it is referred to as brine. Brine is very corrosive and could provide life-threatening symptoms if human exposure occurs. We already know that exposure to brine, over time, kills vegetation, harms habitats, and can cause toxicity issues in humans. 3. It requires a lot of energy to be successful. For the desalination process to be successful, an intensive energy investment must be made. The levels of energy that are required for this process to create potable water are the highest of any other option that we currently know right now. Even in established markets, where desalination technologies have proven to be viable, the costs are still very high. For fresh water access in the United States, the average household of 4 pays about $4.50 for 100 gallons of daily water. Desalinated water access is 25% to 75% higher. 4. It removes the nutrients from the water supply. To effectively remove the salt from the water, desalination requires a membrane that can screen the water. This process, called reverse osmosis, is quite effective at water desalination. Unfortunately, the process of reverse osmosis also removes the nutrients that water provides. Water from desalination does not contain calcium, potassium, or magnesium either. These items must be added back into the water for it to maintain its personal benefits, which comes with an added cost to the water supply. 5. It requires a lot of saltwater to create a small amount of fresh water. Even with modern membrane technologies, the fresh water return from saltwater being desalinated can be as little as 5%. On an industrial level, the 95% of the remaining water is then sent to a treatment facility or a wastewater center for further processing. Even then, the water may not be fully desalinated and might eventually be returned to its original collection point. Although we do gain fresh water supplies from desalination, the actual return that is received from this technology can be quite minimal. 6. It creates pollution that must be managed. To create the membranes, filters, and other items that are used for desalination, there is a fossil fuel expense that must be considered. Coal, for example, is a primary component of activated carbon filters. 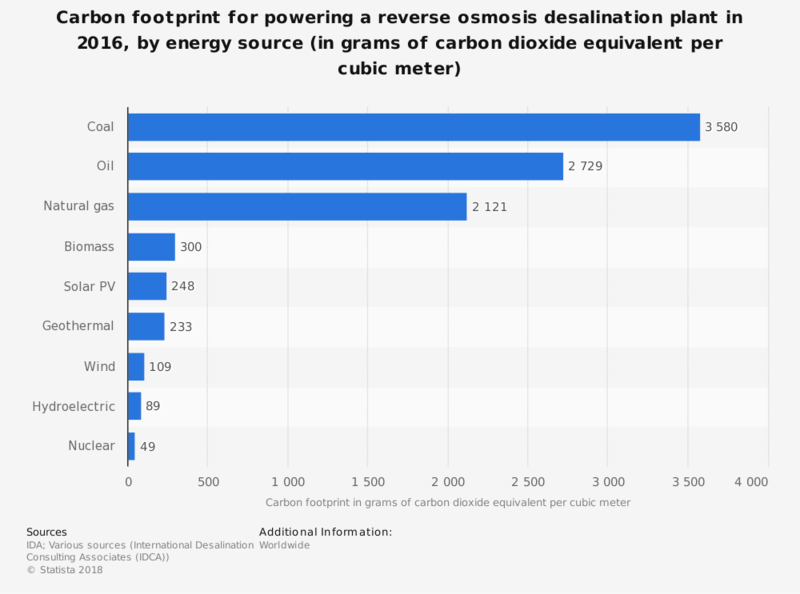 Combustible fossil fuels can release emissions into the environment that may hasten the need for additional desalination facilities in the future. Then there is the brine solution which must be managed as well, with its own fuel and storage costs to consider, especially if the plant uses an outflow process. 7. It may inadvertently kill marine life when used on an industrial scale. Large desalination plants can have a big toll on ocean biodiversity. The intake pipes that are used to collect water supplies for treatment can also bring in plankton, fish eggs, larvae, and microbial organisms. These are the fundamental components within the food chain that exists within the ocean. By altering the abundance of their presence, other forms of marine life become affected as well. In time, since we are at the top of this food chain, desalination even affects what seafood options are available to us. 8. It offers a risk of groundwater contamination. The process of reverse osmosis creates a waste product that may sometimes be disposed of in landfills. These concentrated minerals and salts can seep into local groundwater tables, especially if stringent controls are not in place. Should this occur, the alterations to the groundwater could alter how croplands can support agricultural efforts. It could create drinking water issues for local wells that have been drilled. In severe circumstances, individualized water access could even be restricted. 9. It can be a highly acidic water source. Even with reverse osmosis technologies in place, desalinated water is typically more corrosive than “standard” fresh water. The pH levels of freshly desalinated water can be as low as 6.5. At that level, it can be corrosive to the plumbing pipes, network pipes, and other components of a water distribution system. Without a way to correct pH levels, such as through a marble filter, then the water source can be more acidic and cause potential digestion issues in certain individuals. 10. It may not screen out all harmful contaminants. The reverse osmosis process is known to filter out a vast majority of potential harmful contaminants that may be in the water supply. Even a 99.97% effectiveness rate means that 3 potentially harmful contaminants out of every 1,000 can slip into the general water supply. For that reason, additional investments are often necessary to maintain safe water supplies. That may involve chlorination, UV light exposure, and other disinfectants that prevent internal contaminant growth, but can also cause exposure concerns to some end users. The top pros and cons of desalination show us that we have a viable method of retaining potable water supplies in a changing environment. With continued infrastructure investments, this technology could potentially solve water access issues for the rest of the world. At the same time, there are specific risks that must be constantly managed with desalination to continue receiving the benefits of this technology.